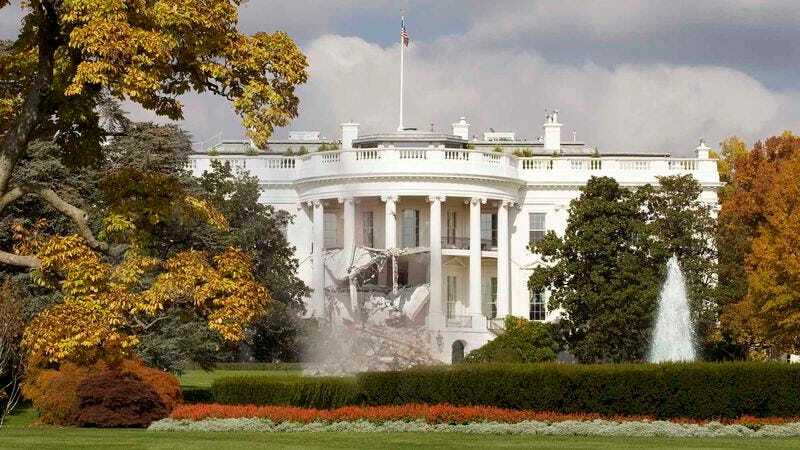 WASHINGTON—Police and emergency responders were called to 1600 Pennsylvania Avenue in the early morning hours Thursday after the White House’s Truman Balcony collapsed under the weight of dozens of reveling administration officials, leaving nine senior staffers with moderate to severe injuries, sources reported. “It was made clear to the occupant at the time he moved into the residence that the balcony was not designed for more than five people at a time, but he went ahead and made the reckless decision to let the whole Communications Office out there anyway, and unfortunately this tragedy is what resulted,” said Capitol Police Chief Kim Dine, who was unable to confirm reports that, prior to the collapse, a roughly 20-foot-long beer bong had been seen extending from the balcony to a group of boisterous cabinet officials on the South Portico porch below. “We had responded to this location several times in the past for noise complaints, and we informed administration officials each time that the balcony was only to be used for photographing the First Family or gazing out at the ceremonial gardens. No parties, no barbecue grills—nothing like that. This was, sadly, a very avoidable mishap.” The incident marks the largest emergency response on Capitol grounds since January, when 10 freshman congressmen were rushed to George Washington University Hospital with acute alcohol poisoning following an out-of-control Ways and Means Committee hazing ritual.